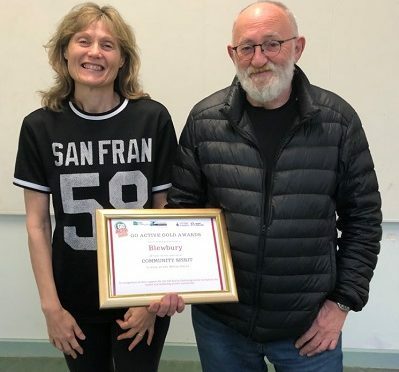 The Go Active Gold Community Spirit Award in The Vale of White Horse was awarded to Blewbury at a recent event and the certificate below presented to the chair of the Parish Council. Well done Blewbury and the residents who regularly take part. Thanks go to the instructor Jo Cassells, all the other organisers of this very worthwhile scheme, the bulletin and the clubhouse. There are hopes that other sports and courses will become available soon. Here is a summary of what was said at the event. Blewbury Village has been one of our new villages for 2018. We have set up a few activities in the village which have been well attended by residents. The Nordic walking Event saw a great number of participants take part and enjoyed a scenic walk around the local countryside. The local Blewbury Bulletin has always been accommodating, regularly promoting our sessions and we have had a positive relationship with Blewbury Clubhouse which has enabled us to run our two very successful Chair Yoga and Senior Circuits classes.